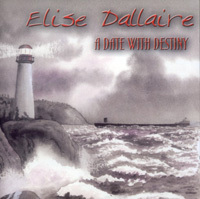 Elise is pleased to announce the release of her new album "A Date With Destiny". The album includes 15 tracks about shipwrecks, lighthouses and ghosts of the Great Lakes and Georgian Bay. To purchase the cd with Visa or Mastercard, please call 1-866-204-5420. Cost: $20 per cd, tax included.